mmsonline.com October 2017 MMS 75 FEATURE the collet segments remain parallel to the stock. Parallel clamping is said to minimize stock "push back" and requires less drawbar force to achieve the same gripping capability as conventional col- lets. This system can accommodate bar diameters ranging to 3.25 inches, and a typical FlexC collet head has a gripping range of ±0.020 inch smaller and larger than its nominal size to accommodate for barstock size variation without having to change to a different-sized collet. The shop uses standard three- and six-jaw chucks for workpiece diameters larger than 3.25 inches. 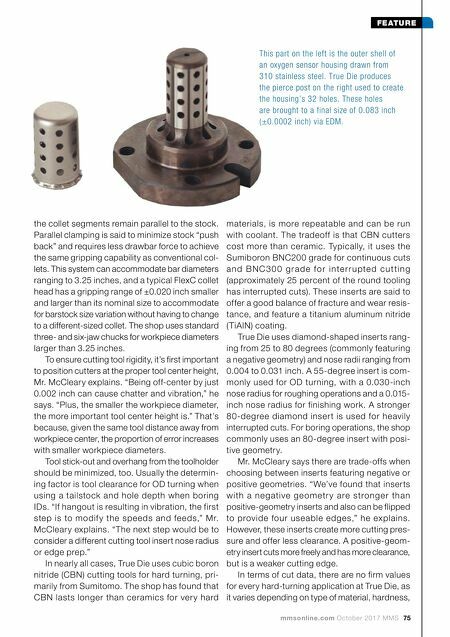 To ensure cutting tool rigidity, it's first important to position cutters at the proper tool center height, Mr. McCleary explains. "Being off-center by just 0.002 inch can cause chatter and vibration," he says. 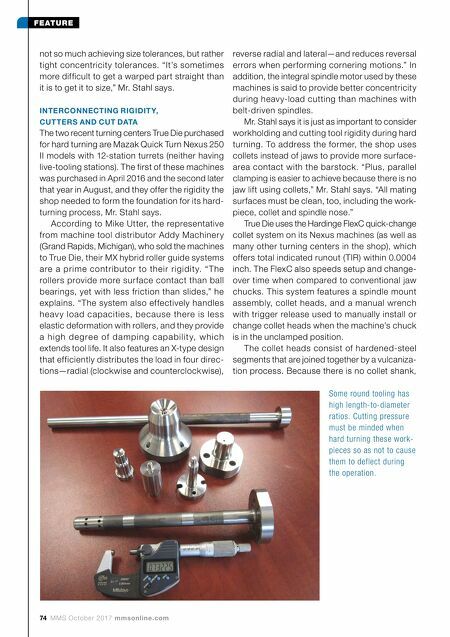 "Plus, the smaller the workpiece diameter, the more important tool center height is." That's because, given the same tool distance away from workpiece center, the proportion of error increases with smaller workpiece diameters. Tool stick-out and overhang from the toolholder should be minimized, too. Usually the determin- ing factor is tool clearance for OD turning when using a tailstock and hole depth when boring IDs. "If hangout is resulting in vibration, the first step is to modif y the speeds and feeds," Mr. McCleary explains. "The next step would be to consider a different cutting tool insert nose radius or edge prep." In nearly all cases, True Die uses cubic boron nitride (CBN) cutting tools for hard turning, pri- marily from Sumitomo. The shop has found that CBN lasts longer than ceramics for ver y hard materials, is more repeatable and can be run with coolant. The tradeoff is that CBN cutters cost more than ceramic. Typically, it uses the Sumiboron BNC200 grade for continuous cuts a n d B N C 3 0 0 g r a d e f o r i n te r r u pte d c u t t i n g (approximately 25 percent of the round tooling has interrupted cuts). These inserts are said to offer a good balance of fracture and wear resis- tance, and feature a titanium aluminum nitride (TiAlN) coating. True Die uses diamond-shaped inserts rang- ing from 25 to 80 degrees (commonly featuring a negative geometry) and nose radii ranging from 0.004 to 0.031 inch. A 55-degree insert is com- monly used for OD turning, with a 0.030-inch nose radius for roughing operations and a 0.015- inch nose radius for finishing work. A stronger 80-degree diamond inser t is used for heavily interrupted cuts. For boring operations, the shop commonly uses an 80-degree insert with posi- tive geometry. Mr. McCleary says there are trade-offs when choosing between inserts featuring negative or positive geometries. "We've found that inserts with a ne gati ve ge ometr y a re stronge r tha n positive-geometry inserts and also can be flipped to provide four useable edges," he explains. However, these inserts create more cutting pres- sure and offer less clearance. A positive-geom- etry insert cuts more freely and has more clearance, but is a weaker cutting edge. In terms of cut data, there are no firm values for every hard-turning application at True Die, as it varies depending on type of material, hardness, This part on the left is the outer shell of an oxygen sensor housing drawn from 310 stainless steel. True Die produces the pierce post on the right used to create the housing's 32 holes. These holes are brought to a final size of 0.083 inch (±0.0002 inch) via EDM.